With 134 to chase, Indian team approached cautiously and completed the smooth chase, although with only 3 overs remaining for the dya and won by 6 wickets. Earlier 4th day saw India batting slowly to reach 499, and Australia losing 3 wickets and still unable to complete the deficit of first innings. The 3rd day of the test match has memorable peformances from Steven Smith, Starc and Murali Vijay. But Shikhar Dhawan snatched the highlights with his unbeaten 185 runs and creating many records. He needs 4 more boundaries (to reach 37) for the highest boundaries by a debutant. Dhawan was declared Player of the Match. 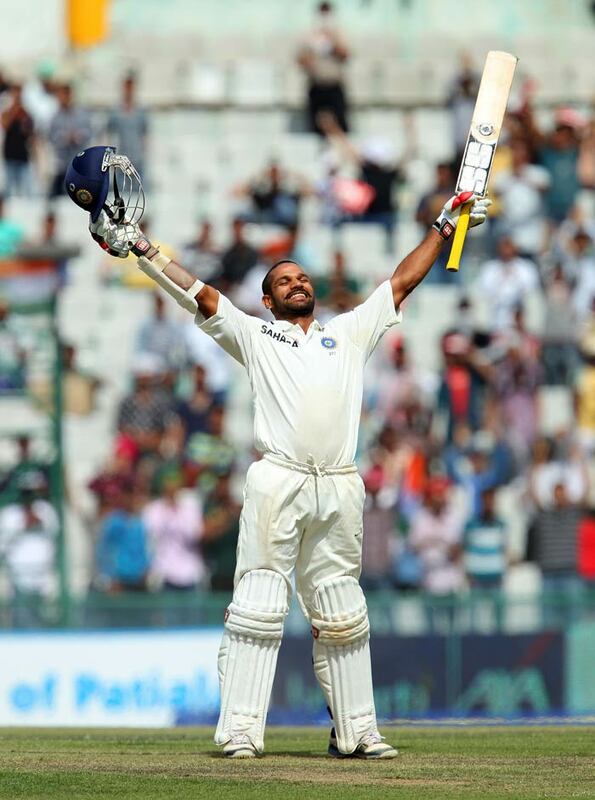 85-ball century by the Dhawan is the fastest by any debutant in test matches. Dhawan is the only Indian opener to score century on debut, and 2nd opener in the World after Kuruppu to do so. 2nd instance for India when both openers scored 150 or more runs in an innings. 289-run 1st wicket partnership between Murali Vijay and Dhawan is the highest in Ind-Aus test series for 1st wicket by India (217 between David Boon and Geoff Marsh was the highest), and overall 3rd best for India. Dhawan’s score and his partnership is a record for Mohali ground. 5 or more dismissals in an inning is Dhoni’s 10th such achievement. Murali Vijay scores 3rd test century (all against Australia). 4th time for India to go 3-0 up in a test series, first time against Australia. Earlier achieved the feat against New Zealand (1968), England (1993) and Sri Lanka once (1993-94). First time in 25 years, since 1988-89 home series against West Indies, Australia have lost 3 consecutive test matches in a series. Starc failed to become the 15th man to score a century by just one run. Pollock has got 2 centuries at number 9. Can Wang Stop Saina in Semifinal! !